Quick Answer: If you are in a hurry, our recommendation for the best pillow for baby flat head syndrome is the Baby Love Memory Foam Pillow. Have you noticed a flat or indented spot on your baby’s head that has you concerned? You may have taken your little one to her doctor only to hear that your baby has the flat head syndrome and that it is nothing to worry about. But as a parent, that is easier said than done, especially when you notice an abnormality with your precious little baby. So, what is a flat head syndrome, and can something be done to prevent or reverse it? We are here to help you through this, answering your questions and concerns, and giving you some options that will keep your baby happy and ease your mind. 1 What Is Baby Flat Head Syndrome? 2 Is The Condition Dangerous? 5 A Word of Warning! Have you ever put your hand on the back or top of a newborns head and felt a gap in their skull (often known as a soft spot? That is because babies are born with soft heads. Their skulls are not like ours (solid, in one piece), but rather they are in several pieces to allow movement as they are developing. Babies’ skulls are like this for two reasons. First, your child’s brain grows at a tremendous rate over the first three years of her life. When she is born, her brain already has about all the neurons it ever will. By the end of her first year, her brain will double in size, and by age three it will already be about 80% of its adult volume. With all that growth, the skull needs to remain flexible so that brain growth in not restricted. Second, the separation in your baby’s skull allows for easy molding and flexibility when descending through the birth canal. Imagine if your baby’s skull was solid. There would be no way for her to pass through without major damage to you or herself, if she could even pass at all. Now, even though baby’s skulls need to be softer for these reasons, it can also cause them to be misshapen due to birth or the position they lay in. Due to pressure on the skull from these things, babies may develop a flat spot on their skull, developing what is known as Flat Head Syndrome, or Positional Plagiocephaly. Most cases of positional plagiocephaly are not dangerous. They do not cause any problems with brain development, and are actually very common. You should always notify your pediatrician if your baby develops flat spots on their so it can be monitored as your baby develops. In some cases, this condition will affect your baby’s neck and her range of mobility. This is known as torticollis. It is usually caused by severe head flattening in one area, which can cause your baby to stay laying on that one area and develop a stiff neck. In rare cases, this can also develop in the womb. If a baby is too cramped for an extended period of time, it can cause head flattening and not allow proper neck movement. While torticollis can be difficult to overcome (you know the feeling if you have ever woken up with a stiff neck), it is also something that is easily treated with proper care and resolved over time. Your doctor will be the one to diagnose the problem, if it is flat head syndrome, and to what degree the flatness may affect your baby. They will check for the baby’s head and neck movement and will monitor this over several visits. Most cases of plagiocephaly heal themselves over time. Especially when they are caught when the baby is still young and the skull is still soft. There are things that you can do to help the reshaping process, or at least keep it from getting worse. A big part of the reason that babies develop flat head syndrome is due to the fact that they are always on their backs, especially when they sleep. It is important to keep your baby in this position as it reduces the risk of suffocation from lying on the stomach and SIDS. You can reposition your baby’s head while she sleeps to keep flattened areas from getting flatter. Turn your baby’s head from side to side, allowing the flat part to be off the mattress so that it can round itself out again. I am very thankful that my baby did not develop flat spots on her head (despite being born with a “cone head” which lasted for the first few days). I believe this is because she did a lot of tummy time. Supervised tummy time is the best way for your baby’s head shape and neck strength to develop properly. This will be key for later development, which will involve crawling and sitting up on her own. Severe cases of plagiocephaly require extra treatment in order to round out the baby’s head. If your baby’s flat head syndrome does not improve after 2-3 months of repositioning at home, your doctor may prescribe a helmet for your baby to wear. They typically work best between the ages of 4-12 months when the bones are still moldable, and your child is still growing at a fast rate. By applying gentle but constant pressure on the baby’s skull, the helmet helps to redirect the bones and promote rounding. For cases that may not be severe but need a little extra help, you can look into getting your baby a pillow specially designed for rounding out the shape of her head. This is much less expensive than a baby helmet – which can run into thousands of dollars if not covered by insurance – and much more comfortable for your baby. Most pillows are very comparable to one another, so how do you choose the best one? Babies have very sensitive skin, and certain fabrics, dyes, chemicals, and detergents can cause rashes and breakouts in young babies. You are best opting for something organic or hypoallergenic. This will keep your baby’s skin happy and clear of any rashes due to irritants. As babies grow, their skulls will become more solid, and their necks and spines will strengthen so they can support their own weight. Most babies will not need a shaping pillow beyond about 6 months of age, but everyone will differ. The soft spots in their skull can remain beyond one year (my daughter was 14 months old with her tiny little soft spot still on the top of her head). If you choose to use the pillow for naps and bedtime, you will want to find one that can still fit your baby as she gets older. Babies are messy and unpredictable with fluids coming out of both ends that could ruin anything they come into contact with. Their clothes and bedding will need to be washed regularly due to spit up and diaper blow outs. The last thing you want is to have a pillow that is a hassle to wash.
Hand washing and air drying may be alright for minor messes, but being able to use the occasional machine wash will ensure a thorough clean… and it is easier. Babies still need to be able to move their heads from side to side. This will help to prevent a stiff neck and promote proper development of the neck and spine. She will also need to be able to move her head in case she spits up while lying on her back so she does not choke. The pillow should not prevent an appropriate level of movement. While most cases of positional plagiocephaly occur as the result of pressure on the baby’s head while sleeping, the American Academy of Pediatrics does not recommend using a positioning pillow in the baby’s crib while she is sleeping. Any soft or bulky items, like pillows, blankets, or stuffed animals, left in a baby’s crib are suffocation hazards, especially if your baby has begun to roll on her own. If you do choose to use a pillow to help shape your baby’s head in her sleep, please only do so during naps when she can be constantly supervised. Instead, we recommend using these pillows for play time during the day when your baby is awake, supervised, and aware of what is around her. Some of them are best used in swings and strollers, and others are great for use with floor gyms. We all know that memory foam can work wonders for any adult who has trouble sleeping or has a bad neck. Why would it not be the same for a baby? 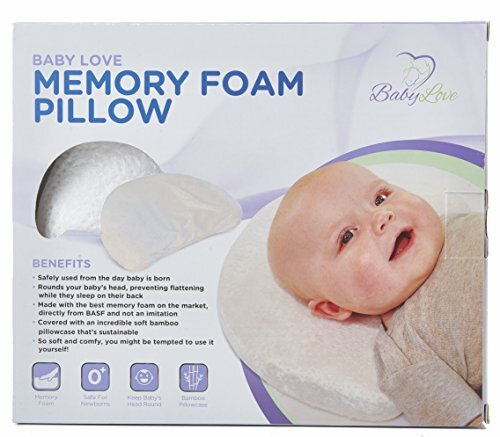 This memory foam pillow from Baby Love USA offers great support by molding to your baby’s unique shape. 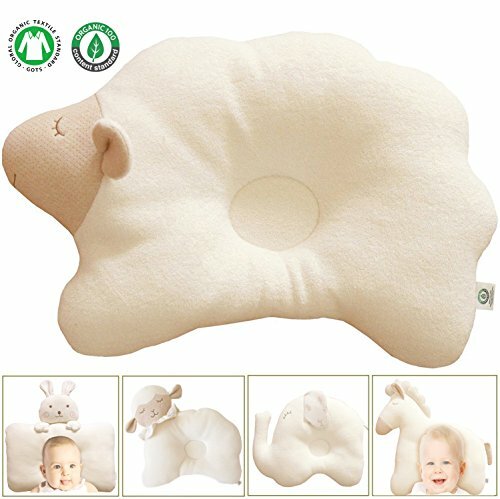 Due to this pillow’s unique shape, it actually supports your baby’s shoulders in addition to her head and neck, which will help to keep the neck aligned better. Included with this pillow is a washable bamboo fabric pillowcase, which will make cleaning this pillow much easier and will save you the hassle of trying to find something to protect the pillow from eventual spit ups. The memory foam molds to your baby’s unique shape while still supporting and promoting proper head shape development. With its wedge shape, younger babies may need to be readjusted on the pillow as they wriggle and slide down. If your baby is like mine, she gets hot very easily. She may need minimal clothing and blankets when she sleeps, as too much will turn her into an unhappy, sweaty mess. This pillow from WelLifes is perfect for babies like mine as it is breathable and keeps your baby cool. There are two available shapes for this pillow – one that can be used flat on the floor or in a crib, and one that can bend a bit more to fit in strollers and car seats for head and neck support. With all the great colors and designs, you are sure to find something that fits your personal taste. The mesh backing of this pillow allows for proper air flow, which will keep your baby happy – both warm in the winter and cool in the summer – and eliminate odors that may build up from sweat. Made from organic cotton, this pillow is great for babies with sensitive skin as it reduces irritants that may cause rashes and breakouts. This pillow can be a bit small for babies older than 4 or 5 months. Since they are more mobile – kicking and starting to roll – they may fall off the pillow and need to be repositioned often. This pillow is not a simple wash and go product. It is recommended to hand wash in cold water and keep away from heat, like dryers and irons. If you are a mommy on the go, your baby will be spending a lot of time in the stroller. You will need a pillow that can travel with you, so that the pressure of sitting in the stroller does not flatten your baby’s head while you are out and about. This pillow was specifically designed for use with strollers, swings, and bouncy chairs. Now your baby can have support for proper head shape development when she is running errands with you or napping in her swing at home. This pillow can be washed with your baby’s other clothing and bedding items, which should be washed on a delicate cycle with dye-free detergent, to prevent irritation to your baby’s skin. Since this pillow was designed to be used with a stroller or swing, it is not great for use alone. Unlike some of the other pillows we looked at, this one would not be one you would get for your baby’s floor gym or crib. This pillow runs a bit small and is advertised to fit babies up to 4 months old. If your baby needs additional support in later months, you will need to buy a new pillow or insert that will fit her better. 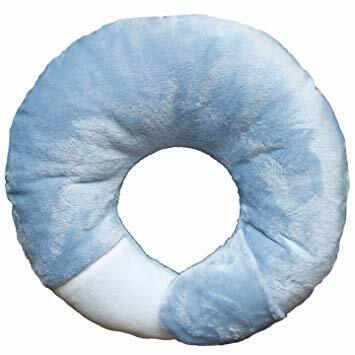 While this pillow is good for stroller use, it is not recommended for car seat use, since it does not have neck support for the amount of movement a car makes. As we mentioned before, your baby will likely be using her pillow when she is lying on the floor playing with toys or her baby gym. This pillow is perfect for standalone use when your baby is lying in one spot for extended periods of time. The small size of this pillow allows it to be fit easily into a diaper or toy bag, making it easy to take with you when you go to family or friends’ houses. You are sure to find something that fits your tastes with the variety of colors and pattern available for this pillow. This pillow can easily be washed and dried by machine due to its durable polyester fabric. Even though this pillow is advertised with the ability to be used in car seats and strollers, it is not recommended and would not work well due to its ability to move easily and not being held in place by straps. Babies who are starting to roll run the risk of suffocation or injury with this pillow by rolling face down on it or rolling off. For such a simple design, it is a bit pricey, even though it is far cheaper than far more expensive helmet treatments. With your baby’s sensitive skin, you may be looking for a good organic pillow right from the get go. Look no further. This pillow from JOHN N TREE Organic is a great choice when it comes to baby pillows made with organic materials. This pillow, unlike the others we have looked at, comes in several animal shapes rather than different patterns and colors. You can choose from sheep, monkey, bird, elephant, or horse. This pillow is made from 100% organic cotton and is even free from all treatment chemicals, pesticides, or dyes that can irritate your baby’s delicate skin. 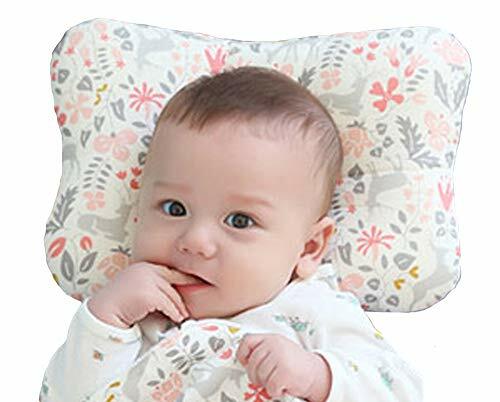 With its wide, flat design, this pillow allows for a full range of head movement to keep your baby’s neck from getting stiff while supporting proper head development. The care instructions for this pillow are very detailed, requiring a gentle cycle on the washing machine, preferably in a laundry net, at about 86° F (30° C). The pillow’s material is not as breathable as the pillows we have seen with mesh backing or an opening for the head. This may cause your baby to become warm and sweat a lot. If we had to choose one pillow as the best overall choice, we would have to go with the Baby Love USA Memory Foam Pillow. Hypoallergenic: This pillow comes with a hypoallergenic bamboo fabric pillowcase and the pillow itself is antimicrobial, which will keep your baby’s skin happy and free from rashes and blemishes. Size: Due to its wide design, which supports a baby’s shoulders from a young age, this pillow will grow with your baby and allow her to use it even into toddlerhood. Easy to Clean: The removable pillowcase is easy to machine wash, and the protective coating on the memory foam allows for easy wipe down when inevitable messes happen. 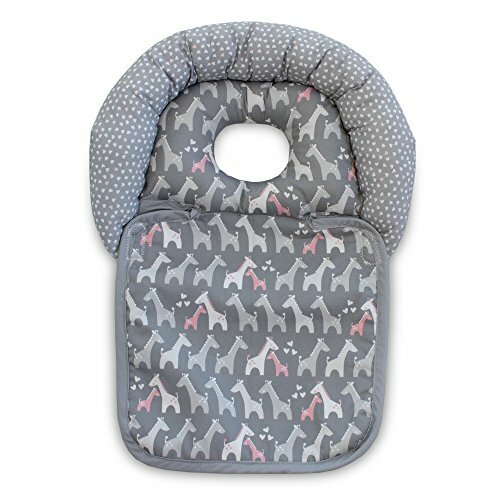 Allows Movement: With its wide design and its head indent being subtle (not too deep), this pillow allows for full range of movement which will help keep your baby’s neck from getting too stiff and will promote the healthy development of the neck and spine. If you are concerned about positional plagiocephaly, try this pillow. It is sure to give you the results you desire to see, creating a happy baby and some relieved parents.